RESTON, Virginia, April 26, 2015 (ENS) – The number of earthquakes triggered by human activities has soared since 2009 in the central and eastern United States. New research by the U.S. Geological Survey links the increase to industrial operations that dispose of wastewater or other fluids by injecting it into deep wells. USGS scientists identified 17 areas in eight states with increased rates of “induced seismicity,” which means earthquakes and tremors caused by human activity that alters the stresses and strains on the Earth’s crust. Since 2000, several of these areas have experienced high levels of seismicity, with substantial increases since 2009, levels that increased even more since 2013 and continue to increase today. This report is the first comprehensive assessment of the hazard levels associated with induced earthquakes in the United States. 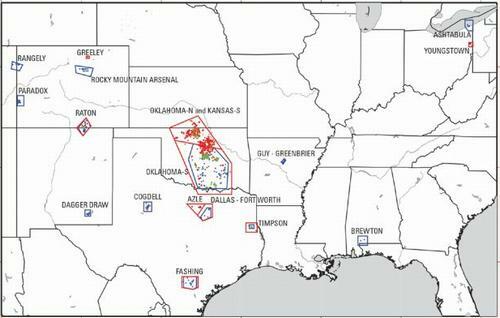 These human-caused earthquakes are occurring in eight states: Alabama, Arkansas, Colorado, Kansas, New Mexico, Ohio, Oklahoma, and Texas. The greatest number of induced earthquakes by far have been felt in Kansas and Oklahoma. 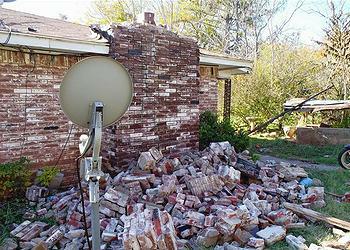 “Prior to 2012, there was virtually no earthquake activity in southern Kansas and northern Oklahoma, but in 2013 and especially in 2014, the number of earthquakes in that region increased dramatically with several hundred earthquakes being recorded,” the USGS reports. Large volumes of polluted wastewater can result from energy production, among other industrial processes. Wastewater that is salty or polluted by chemicals needs to be disposed of in a way that prevents contaminating freshwater sources. Deep well injection of wastewater increases the underground pore pressure – the pressure of groundwater held within a soil or rock in gaps between particles, or pores. Although the wastewater disposal process has the potential to trigger earthquakes, most wastewater disposal wells “do not produce felt earthquakes,” the report states. Questions have been raised about whether hydraulic fracturing, known as fracking, is responsible for the recent increase of earthquakes. The researchers distinguished between natural, or tectonic, earthquakes and those induced by human activities. The models aim to calculate how often earthquakes are expected to occur over the next 12 months and how hard the ground will likely shake as a result. “This new report describes for the first time how injection-induced earthquakes can be incorporated into U.S. seismic hazard maps,” said Mark Petersen, chief of the USGS National Seismic Hazard Modeling Project. “These earthquakes are occurring at a higher rate than ever before and pose a much greater risk to people living nearby,” Petersen said. Patterns of increased seismicity vary between the 17 different areas analyzed in the report. Some areas show pulses of increased activity interspersed between periods with little or no activity as in Cogdell, Texas, and Rangely, Colorado. Other areas, such as central Oklahoma and southern Kansas, show exponential growth patterns of seismicity that are continuing in 2015. “The USGS is developing methods that overcome the challenges in assessing seismic hazards in these regions in order to support decisions that help keep communities safe from ground shaking,” Petersen said. To discuss the latest research on induced seismic activity, and to obtain feedback on products that will be useful for decision makers, the USGS and the Oklahoma Geological Survey cohosted a workshop that included about 150 participants from academia, industry, and government on November 17-19, 2014 in Midwest City, Oklahoma. workshop, shows alternative input models and corresponding uniform hazard maps, and describes a research agenda for improving future seismic hazard assessment products. Participants wanted to know how buildings, bridges, roads, and other structures should be designed to withstand induced earthquakes. The USGS report acknowledges difficulties in assessing seismic hazard that arise from a lack of relevant technical information on human industrial activity such as pumping data for injection wells. So, this report does not explore the causes of the increased seismicity, but rather tries to quantify the associated hazards. Also, this report does not address the seismic hazard from induced earthquakes due to mining activities. Many questions remain, the USGS acknowledges. 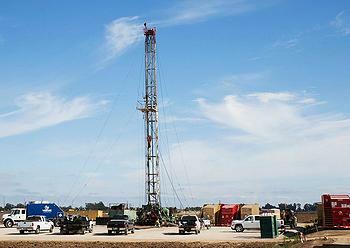 “Predicting when and where induced seismicity will occur in the future is challenging. For example, induced seismicity does not occur near every disposal well, so it is important that we continue to study and learn more about how these earthquakes are generated, so we can better assess future patterns and trends,” the report states. This report looked at the central and eastern United States; future research will incorporate data from the western states as well.